I spent the weekend up in the Midlands visiting my extended family. I had a fantastic time. It was great to catch up with everybody again, I've not seen any of them since last Christmas. We went for a massive family meal at a hotel, and were right next door to a wedding reception. The hotel had one main bar next to the reception, which both parties shared. The wedding celebrations came to an end and they began to leave in small groups about mid way through our meal. I went to the bar with my aunt as the bride walked by, looking slightly upset and worried. We congratulated her - as you do - and we were replied to with a grunt. That seemed a bit rude, but we dismissed it and went back to our tables. Our meal finished and the family split into groups to head home. My uncles managed to sneak away to a nearby pub and catch the football, returning home quite amused that some lads had been shouted at by an angry bridesmaid from the wedding reception. It turns out that I had seen the bride looking so upset because her new husband, the best man and the usher had made their way to that pub to watch the football without telling anyone. Nice way to start married life. Neither of us are particularly skilled at football, nor do we seem to stick to any kind of agreed rules, but I think he enjoys it. 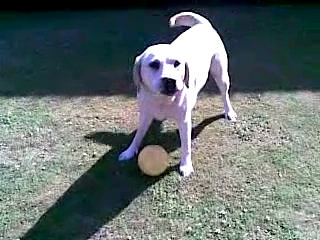 I accuse him of cheating when he picks up the ball and runs away with it, to which I just get growled at.